As new parents, you know the joy of looking into the face of your adorable little prince or princess and knowing that you would be willing to give the whole world to your little tyke. Of course, that’s sometimes a tough thing to do, especially when the world is filled with several other adorable little babes that some would dare to claim are cuter than your little one.Ridiculous! How can any other kiddo compare to the perfectly soft cheeks that you can hardly resist nuzzling? The stretching tiny fingers, the soft and loving gaze they give you… though, perhaps you could do without that impressive roar of theirs! Who knew that such a tiny creature could have such powerful lungs!? But, even that should be a marker to prove your little one’s lordly state. So, the questions that line up next are how to give the whole world to your newborn. Whenever we are posed with such lofty questions, we turn to the animal kingdom to see how they manage it. It doesn’t take any time at all to realize that the little lion cub is lifted up to gaze over the whole of the savannah to see the domain that the furball will one day inherit. The one-day king of the jungle! And they don’t even live in the jungle! That’s an impressive spread of animal kingdom that they control. So, taking those lessons to heart, we have ready for you the Safari Lion Infant costume. This sweet zip up onesie is rib knit with faux fur details to give a soft to touch texture and a white and brown polka dot pattern on the tummy that demands a couple tickles. The hood has an adorable lion smile and is topped with a mane of fur topped by tufted ears. 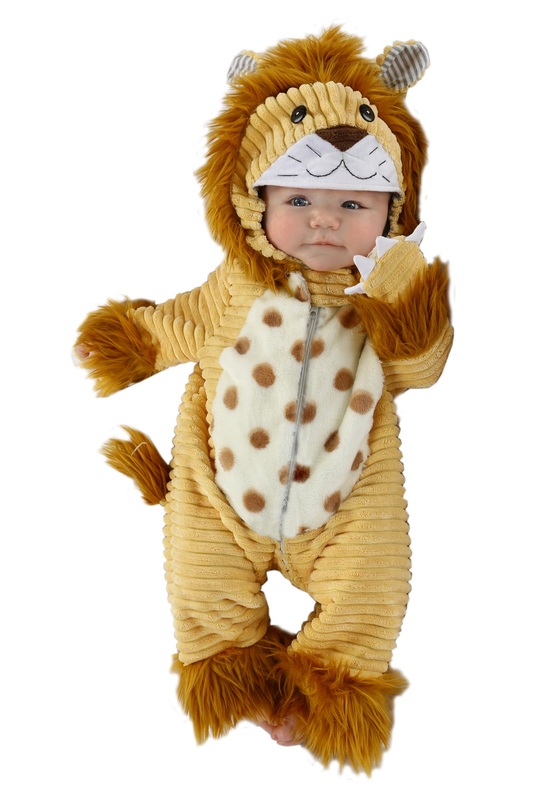 Two minutes after slipping into this lion garb, your little one will be ready to inherit the world… or at least every awww on the block! Overall a cute costume. It fit as expected on my tiny babe. My only complaint would be that it is more yellow in real life than it appears in photos on the website. Still cute though! Everywhere on this site you can see that you shouldn't look at the sizes and that measurments are more accurate. If that was the case I would have purchased a different, bigger, cuter and cheaper costume. Other than that: The costume looks good. It's cute and fun.